How to "Build a Better You"
Our aspirations for all our students – adults and children alike – is that they grow to meet their full potential and to exceed what they thought were their limits or boundaries. This is not just in their martial arts journey, but the journey of life. The obvious foundation is the training of the body, developing self discipline and the ability to discern when the thinking mind is reflecting the truth or being a traitor to our deeper knowledge and intuition. We all know that when the mind says “I can’t go any further” is when we should push through and persevere – just 10 more push ups and so on. Moving deeper in the realm of the mind we begin see how the physical metaphors, for example ‘ready stance’, ‘fighting stance’ ‘maintaining space and distance’, can translate to our behaviours and internal attitudes. Embracing the concept of a mental ready stance – a calm and still centre – is light years ahead of what most martial arts schools train. Even beginning to understand the role of the ego and the self in our lives and using the lessons in martial arts to improve that understanding is bleeding edge excellence in action. All these things are the building blocks to help improve yourself and to encourage your children as well in growing into fine members of the community. But then recognise that the inner, real you can be a constant that improves and becomes better over time, despite the challenges of aging, loss of physical capabilities. Setting goals – be brave and dream large – here martial arts assists us – at Quantum Martial Arts, we confidently state that “anyone can attain a black belt” – no matter what the impediments… and a Northstar Ju Jitsu Black Belt is not just handed out. It will be one of the hardest, and most challenging, goal that you can tackle. However Quantum Martial Arts and Northstar Ju Jitsu have helped people from all backgrounds, ages, physical constraints attain that measure of excellence – a Northstar Ju Jitsu Black Belt. 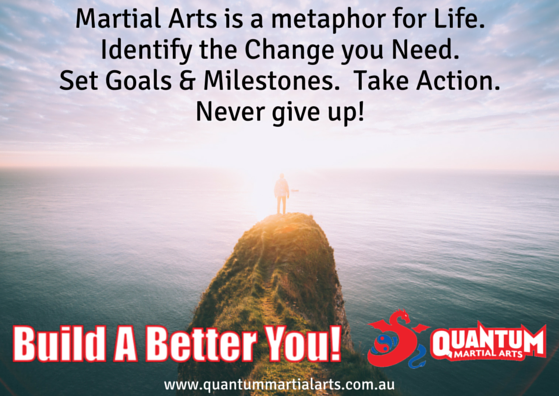 Taking action – and the staged process of attending class and doing the practice you need to at home, as well as general fitness etc builds great mental muscles for the other areas of your life, outside of Quantum Martial Arts, where you can BUILD A BETTER YOU! I have used the approach above to assist me in re-designing my work/life balance, for setting goals to recover from health issues, to set goals to physically and mentally challenge myself, to re-discover and encourage creativity in my life and to keep myself fresh on my martial arts journey and my journey of life including my vocation to enhance other peoples life through being a teacher of a genuine martial art.